LeBron James refers to the Golden State Warriors as the “monster” from the West. The Cleveland Cavaliers superstar got a closer look at the Dubs during the 2017 NBA Finals and the result was downright scary. Steph Curry and Co. won the series in five games, and only a record-setting game by the Cavs saved the series from being a sweep. James gets a fourth shot at the two-time world champion Warriors in the 2018 NBA Finals. The task seems daunting to say the least and almost impossible based the numbers Las Vegas oddmakers are putting up. The Cavs enter The Finals as massive underdogs, but there may be a sliver of hope. There are a few things LeBron and head coach Tyronn Lue could draw up that could keep this series from becoming a complete wipeout. Here are five ways the Cavs can tame the Monsters from the Bay. The Miami Heat won the NBA title in 2006 not because they were better than the Dallas Mavericks, but they were much more physical. And the officials allowed. It’s human nature to root for the underdog, and the same applies to basketball officials. Referees tend to give more rope to lesser teams, and in this case a much lesser team in the Cavs. The Cavaliers won’t beat the Warriors in a track meet. They have to keep the score in the 90s and control the tempo. They can’t let Steph, Klay Thompson and others run around the court unimpeded. Knock ’em down if they have to. Do everything it takes to muck up the flow of the game and make each quarter and each game into a street fight. The Warriors are at their best when they are moving without the ball. Head coach Steve Kerr always preaches ball and player movement. The Cavs could counter the Dubs’ free-flowing offense by inviting Curry and Kevin Durant to put the ball on the deck and play one-on-one. Run them off the 3-point line whenever you can. The Houston Rockets successfully employed this during the Western Conference finals. They were able to draw Durant into a lot of iso-ball by switching everything, even if they were forced into a matchup they didn’t necessarily like. It might harder to make Curry play one-on-one, but the Cavs could dangle a carrot by putting a lesser defender on Curry (i.e. Kevin Love or Kyle Korver) and let Steph go to work. The danger in this approach is that KD or Steph could get insanely hot and score 50 points. But you don’t have many options at this point, so you roll the dice that these two MVPs will eventually wear down playing one-on-one. It’s about time to give Klay Thompson the recognition he properly deserves. He is one of the 10 best players in the world, and arguably the second-greatest shooter of our generation. The man scored 60 points on 11 dribbles. Klay is a pure shooter. The Warriors don’t survive Oklahoma City series in 2016 without Klay and they don’t survive the 2018 conference finals against the Rockets without Klay. Curry and Durant get most of the notoriety but Klay Thompson is the most consistent shooter on the Dubs. Thompson prefers to catch-and-shoot, so it is imperative that the Cavs stay attached to Klay wherever he goes. J.R. Smith should get the bulk of the assignment on Klay, and Lue might even throw in Jordan Clarkson in the mix. The Warriors own one of the best if not the best defense in the NBA. Draymond Green and Durant usually clean up the back end of the Warriors’ defense, so what the Cavs can do is put LeBron on the low block or high post, where he can see where the double teams are coming. Cavs can also use LeBron as the screener off the pick-and-rolls. Anticipating that Durant will get the assignment on LeBron if Andre Iguodala can’t go, the Cavs should put KD in as many pick-and-rolls as possible to wear him down. The Rockets had the right idea in the conference finals, but they focused too much on trying to get Curry in pick-and-rolls. They should have focused on Durant because this will keep Durant from guarding the rim, something he prefers to do in the Warriors’ defensive scheme. 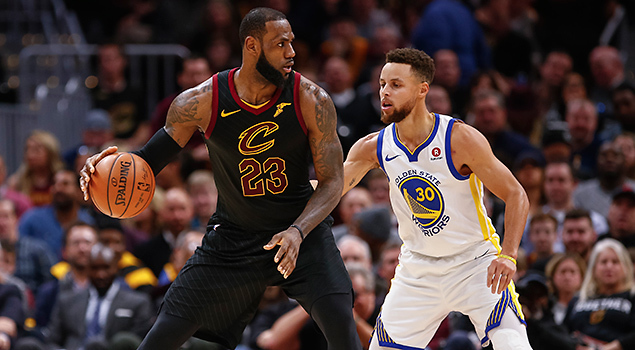 By having LeBron as the roller on the 1-3 pick-and-roll with either George Hill or Jordan Clarkson, he can finish at the rim and it won’t allow the Warriors to load up. LeBron will be playing heavy minutes, so he has to conserve his energy on defense. The Warriors will try to locate LeBron on defense as much as possible. During the 2017 Finals, LeBron got matched up with Durant way too much and it sapped his power source. One way to “hide” LeBron is by having him guard the point guard. The Warriors use Draymond at the point a lot, so the Cavs could put LeBron on Draymond. By having LeBron on the point, he doesn’t have to worry about chasing bodies and he can see all the switches in front of him. And if Draymond decides to be aggressive on offense, let him. Force him into a scorer. Another way to keep LeBron’s legs fresh on defense is by having him on Kevon Looney or Jordan Bell. Both are not a threat to score and the Warriors would rather have them steer clear of the ball as much as possible. Even if the Cavs play the perfect game, there is still no guarantee they’ll keep it interesting for East Coast viewers. Some of the games might be over by halftime. LeBron said he will squeeze every once of juice left in these Cavs. Whatever gas is left in LeBron’s tank, he will surely empty it in this series. If LeBron James is able to somehow pull off the impossible and beat the Dubs, he should drop the mic and retire on the spot.